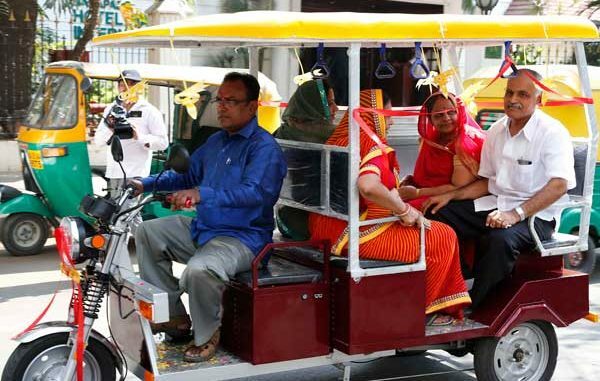 NEW DELHI: India will roll out nearly 100,000 battery-powered buses and autorickshaws onto its sulfurous city streets in the coming weeks, setting it on the bumpy road to making new vehicle sales all-electric by 2030. Transport is a major source of India’s carbon emissions and the Greenpeace group blames at least 1.2 million deaths a year in the country on pollution. Getting off diesel and petrol would improve the nation’s health and bolster India’s bid to meet the bold climate change targets it pledged in Paris in 2015. That figure is even lower in India, underscoring the enormity of Prime Minister Narendra Modi’s electric challenge. “To go all electric is a daunting task,” said PwC partner Abdul Majeed. Instead it hopes private energy companies will invest in “swapping bays”, where drivers can exchange empty batteries for fresh ones, Ashok Jhunjhunwala, principal advisor to the power minister and the official spearheading the efforts, told AFP. Amara Raja Batteries, an Indian battery manufacturer, would be part of the “swapping model”, said its chief executive S. Vijayanand. “The headache of managing and charging the battery will not be with the driver then,” he said. Reductions in the size and cost of electric vehicles, coupled with rapid technological advances, mean India’s ambitions were “very feasible”, said Bill Hare, chief executive of the Berlin-based Climate Analytics consultancy. Mercedes said it needs a reasonable timeline and improved incentives for motorists — currently a tiny sum that could be withdrawn at any time — to bring in electric cars. Tesla boss Elon Musk — who in July launched Model 3, a mass-market version of Tesla’s pricier cars — has postponed entry to the Indian market. But at $35,000, even the cheapest Tesla is out of reach for most Indians. Most of the three million new cars added to India’s roads every year are far cheaper, compact vehicles. “We want to meet India’s challenges,” Babu said.